Every successful business has a Business Risk Management Plan. And Stock Trading is a business! Every prudent business-person wants to first cover his overhead expense each month, and then concentrate on achieving a steady growth in earnings. Rather than striving for the big hit, they protect capital first and work for consistent returns and take more aggressive risk with a portion of profits. Not accidentally, the big hits and home runs still come along, but they come along without excessive risk. In other words, preservation of capital...leads to consistent profits...which makes pursuit of superior returns possible. This is a risk management plan, and this is how you build wealth. Preservation of capital and money management is the cornerstone of stock trading. Risk is the prime concern. Before asking "what kind of profit can I make? ", ask first "what potential loss can I suffer?". This astute financial risk management. A storekeeper takes a risk every time he stocks new merchandise. If it does not sell, he will lose money. A smart businessman takes only risks that will not put him out of business even if he makes several mistakes in a row. As a stock trader, you are in the business of trading. You need to define your businessman's risk - the maximum amount of money you will risk, or lose, on any single trade. Plain and simple, these are basic risk management principals. There is no standard amount of money to risk, just like there is no standard business. An acceptable businessman's risk depends on the size of your trading account, and your trading method and pain and tolerance. Trading is so exciting that it often makes stock traders feel high, and then suddenly very down. Nobody can get high and make money at the same time. Emotional trading is the enemy of success. Fear and Greed are bound to destroy a stock trader. This is proper stock trading psychology. The goal of a successful professional in any field is to reach his personal best. You need to concentrate on trading right. Each trade has to be handled like a surgical procedure - seriously, soberly, without sloppiness or shortcuts. This is a stock trading risk management plan. A loser cannot cut his losses quickly. When a trade starts going sour, he hopes and hangs on, and his loses pile up. And as soon as he gets out of a trade, the market comes roaring back. Trends reverse when they do because most losers are alike. They act on their gut feeling instead of using their heads. The emotions of people are similar, regardless of their cultural background or educational levels. Emotional traders go into risky gambles to avoid taking certain losses. It is human nature to take profits quickly and postpone taking losses. Emotional trading destroys losers. Good money management and timing techniques will keep you out of the hole. Losing traders look for a "sure thing", hang on to hope, and irrationally avoid accepting small losses. Having a risk management plan is not an option if you want to succeed as a stock trader. Below is a outline that summarizes what a stock trading business plan consists of. This plan is free, just click on the image below. An outstanding course for developing your stock trading business plan is called Business Planning for Traders and Investors. 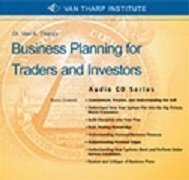 In this MP3 download presented by world renown stock trading coach Dr. Van K. Tharp , you will learn all you need to know about setting up a viable business plan for your trading. The essential elements required to start a trading plan and what it takes to be a committed trader. A top-down approach to discipline that includes daily use of the Top Tasks of Trading, regular journaling, and a healthy lifestyle. The key factors that are essential for any system: stops, R-multiples, expectancy and position sizing™ strategies. Learn about back testing, program and system analysis and how it can take your trading to the next level. Van Tharp also interviews a variety of special guests and provides you with weekly exercises designed to assist you in preparing your risk management plan as the series progresses. To increase your chances of success as a trader, you need to treat your trading like a business. This applies to full time professionals as well as the long term investor who does not trade with frequency! Return from "Risk Management Plan" to the Home Page: "Stock Market For Beginners"